For Saraswthi Padmanabham and her husband, Shyamal Kumar setting up this school seemed to be a very obvious decision to make. Saraswathi and her husband have three children- 8, 5.5,and 4 years old. Saraswathi is a counselor. The couple knew that they wanted to set up the organization, but thought that they would wait until their youngest child started going to school. A couple of years ago, however, the timing felt right- and thus Diya Ghar came into existence. 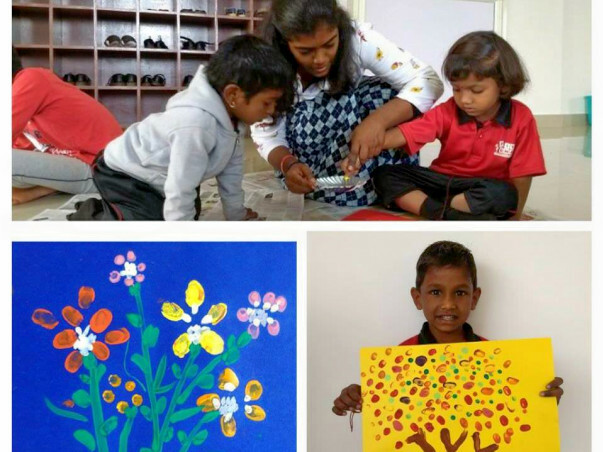 Diya Ghar is a safe haven for children of migrant workers in Bangalore. The school has 30 students who come in every morning at 8.30 a.m. They are picked up from their homes and brought to school. A quick wash and change later they are ready for their breakfast, which is usually porridge and fruit. 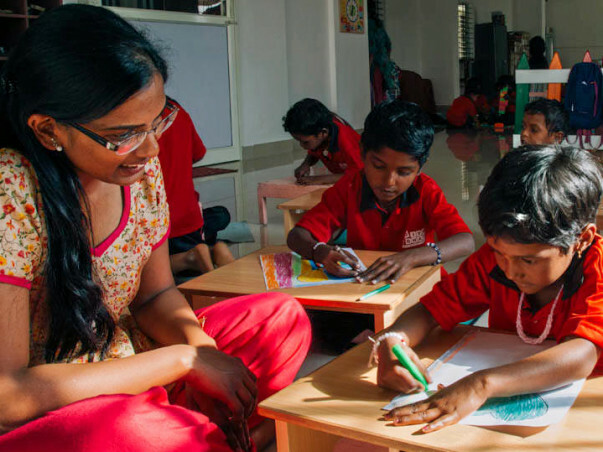 Diya Ghar recently rented out a larger space and from March 2018 will be ready to welcome almost 60 students at their school. The school currently has four full-time teachers and two support staff. Now, Saraswathi needs your help to keep Diya Ghar running as the safe haven it is. Contribute to support Diya Ghar! Gangamma who grew up in a village close to Bellary, longed to go to school as a child. Unfortunately her father died when she was young and she was left with the responsibility of caring for her younger siblings, while her mother worked in the fields. Fast forward 12 years and Gangamma found herself migrating to Bangalore along with her husband, in search of work. As a construction worker, she had no choice but to take Monica, her three year old daughter along with her to the construction site. She longed to send Monica to school. We met Monica's family when we visited their settlement a couple of months ago. When we shared about Diya Ghar, Gangamma had tears in her eyes when she said, "I want my daughter to study and have a good future". Thank you for being a part of God's answer to Gangamma's cry! Thanks to your generous support, Monica and 29 more children have been enrolled into Diya Ghar! 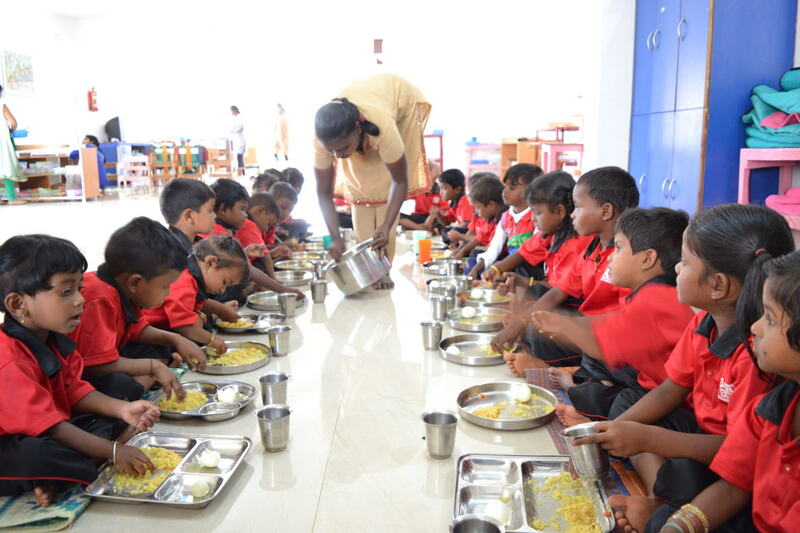 At Diya Ghar, the children receive 2 nutritious meals and an evening snack. They Math and language using the Montessori Method. Last year 6 children graduated from our pre-school and started Class 1. Together we are transforming the lives of migrant children! We are grateful for your generosity! We started this academic year with 60 children who are first generational learners. The children have settled into school and over the last few weeks it is wonderful to see the children enjoying themselves in school. These children now have the opportunity to be in a safe and nurturing environment. Thank you for your generosity! Lakshmi plays with the wooden puzzle and edges the duck piece into the right space. She puts away the puzzle, neatly rolls up her Montessori mat and then sits down to lunch with her friends. Her little fingers pick up mouthfuls of dal rice till she’s wiped the plate clean.Lakshmi is doing what a regular three-year-old should do: play, learn, eat and enjoy themselves. 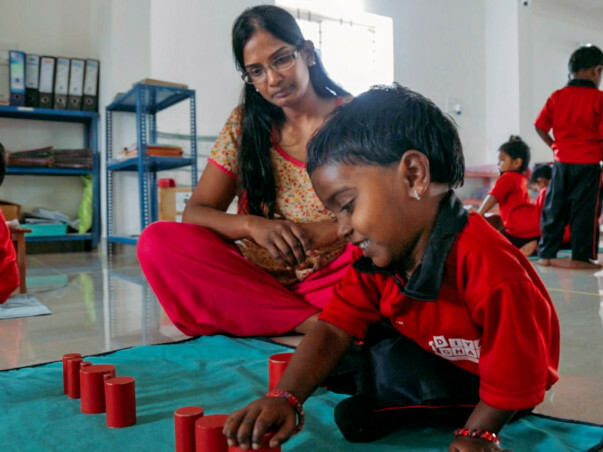 But, just a few short weeks ago, Lakshmi was shouldering a responsibility that no child should. She was left in charge of her one-year-old brother when her parents went to work at a construction site. Sure, the neighbours would keep an eye out for the kids, but when the baby cried, it was Lakshmi’s “job” to feed him the rice or porridge that her mother had prepared.When Saraswathi and the Diya Ghar teachers went to visit the migrant settlement where Lakshmi lived, she quickly held their hand. She even said bye to her mother and wanted to head to school with them right away. After all, she had seen some of her little friends leave for school every morning in the Diya Ghar van. The teachers asked her to stay home for just another year. When the baby turned two, they would take him to school, too. Miraculously, something shifted in Lakshmi’s mom’s mind. 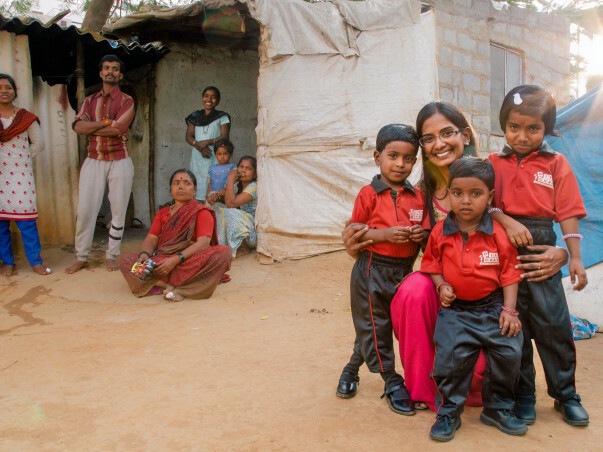 When Diya Ghar started the new school year, Lakshmi’s mom brought her to their school van and waved goodbye. The joy in Lakshmi’s face is evident. Her eyes are bright as she plays and sings and listens to the teachers. She finally has the opportunity to just be a child. Thanks to donors like you, Diya Ghar is able to help 60 other kids like Lakshmi.With the campaign on Milaap, we were able to raise Rs 4.5 lakhs – your generosity far exceeded our expectations.With the funds, we’ll be able buy school supplies for the year, as well as offset expenses for transport, school meals and uniforms. We’re amazed by just how you stepped up to change lives! Together, we are transforming communities, one child at a time. Thank you for giving Lakshmi and the other Diya Ghar kids the joy of learning! Thank you for all you do Saraswathi and DiyaGhar.